Dee Ann: I learned about the Village Improvement Association (VIA) when we first moved to Doylestown in 1985. Although I never expected to take an active role, I was impressed by their focus on our community and providing high quality and advanced healthcare services right here in Doylestown, so people wouldn’t have to travel to get the care they needed. I believed in the importance of that and over the years devoted my volunteer time to helping make that happen in various ways. Marv: My career was spent in the pharmaceutical and medical device industry, with Johnson & Johnson companies, where I worked for 37 years. As the President of J&J’s Interventional Systems (JJIS), I led our team that developed one of the most significant medical devices in recent history called balloon expandable stents. Today, stents are essential in life-saving procedures in cardiac care and endovascular therapies to open blocked arteries. I have great interest in advanced technologies here at Doylestown Hospital, most notably in the specialties of interventional cardiology, plus vascular and heart procedures. 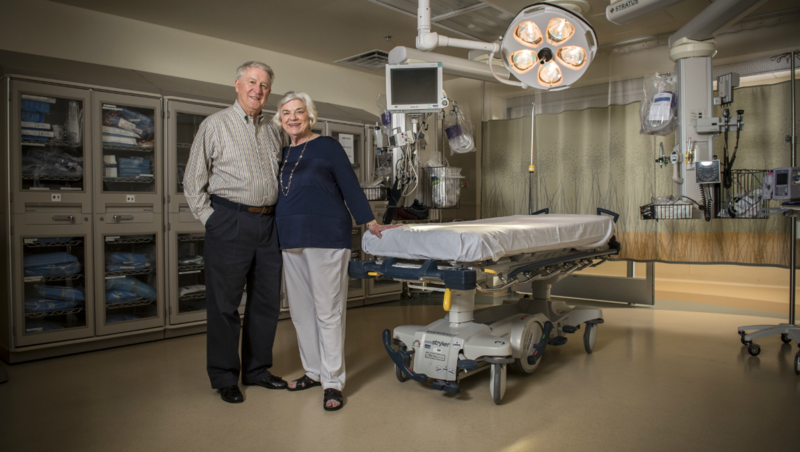 Marv: Over the past many decades, I have been fortunate to work with so many dedicated colleagues, devoted physicians and nursing leadership to collaborate in the development of such transformational medical devices like stents and TAVR, which is an analogue of the original balloon-expandable stent. Our awesome TAVR team at Doylestown Hospital implemented this breakthrough, minimally invasive, procedure to replace a stenotic aortic valve, without the need for open heart surgery at the Heart Institute. To date, we have truly outstanding patient outcomes; and we’ve received national recognition as a leading heart care hospital in the U.S. The TAVR program here is very impressive—and extremely rare—for a community hospital to have this level of sophistication. Normally, this technology gets adopted only at academic centers and larger hospitals. We’re providing world-class care right here in Doylestown. Marv: Yes, interventional cardiologists at the Heart Institute use the interventional catheterization technologies to remove clots from the brain in stroke patients for whom technique and speed are critical. Patients are going from being paralyzed, unable to speak or otherwise debilitated to being fully functional shortly after their blood clot is removed. It’s wonderful how these medical device innovations are saving lives and restoring functionality for our patients right here in Doylestown. Dee Ann: That we offer this at Doylestown Hospital is very important. People can be treated immediately. If they had to be flown all the way to a city hospital, time would be lost, and they might not do as well. Marv: We think carefully about what to support and need to know that an organization can deliver on quality. When we were approached to help create the Chest Pain Center here at Doylestown Hospital, I said I would be willing to do it if the hospital was willing to get the certification first. That was essential to me as a donor. My request triggered a labor-intensive 3,000-page certification process. It focused on the “door-to-balloon” time—how fast a patient with chest pain can move from the emergency room to the catheterization lab for a stent procedure to correct a blood flow or blockage problem. They got the certification and are doing these procedures as well as any hospital I know. In fact, Doylestown Hospital’s average door-to-balloon time is 57 minutes; significantly better than the national average of 90 minutes. The clinical outcomes have been excellent. Yes, we are grateful for the opportunity to have supported the Chest Pain Center several years ago. Dee Ann: We have always believed that education is essential. With Marv’s support, I founded the VIA Women’s Scholarship Fund many years ago. Recently we invested in the BSN 2020 initiative that provides funding for nurses to obtain a Bachelor of Science degree. The goal is for 80 percent of Doylestown Hospital nurses to earn advanced degrees by 2020. I’ve been a Doylestown Hospital patient and experienced firsthand how knowledge translates into exceptional care. The nurses here are extremely capable. They talk to you, listen and are very caring. It makes a difference. Marv: Supporting BSN 2020 and other educational initiatives align with my interest in bringing advanced technology to the hospital. We can have all the technology we want here, but unless we have educated practitioners to implement it, the chances of success are minimized. So, while we support the formal education process for nurses, we also support practical knowledge from a medical technology standpoint. That means making it possible for staff members to travel to educational conferences and meetings where they can listen to enlightening scientific presentations about heart disease or other conditions. They learn what’s new, what works and what doesn’t work. Then they bring their new knowledge back to Doylestown Health, so we are always on the leading edge of the latest medical advances. The VIA volunteers have always been determined to keep Doylestown Hospital an independent community hospital. We want to remain independent. That independence, combined with our smaller size, is an advantage because we can make decisions and adopt new methods quickly. We want to hold on to that. It’s part of fulfilling our commitment to providing the quality healthcare people need right here at home. Dee Ann: Retirement is the only thing I know of that Marvin has ever failed to accomplish! Marv: We plan to stay engaged and to enjoy living in this community. It’s a wonderful place for people of all ages. The schools are excellent and the healthcare system is superb. As we get older, we appreciate the Pine Run Retirement Community and the continuum of care that the VIA has created. We’re never leaving here.